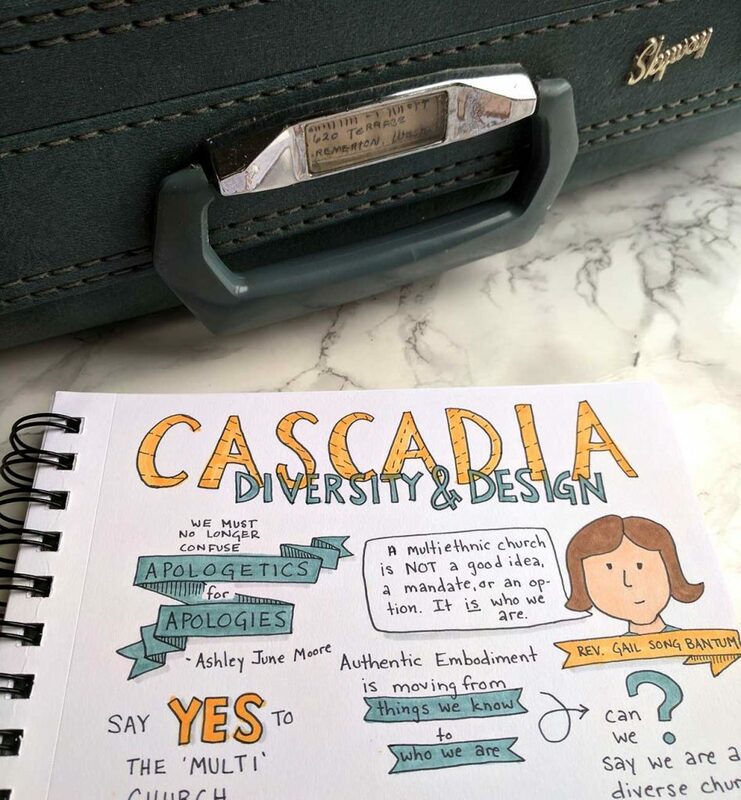 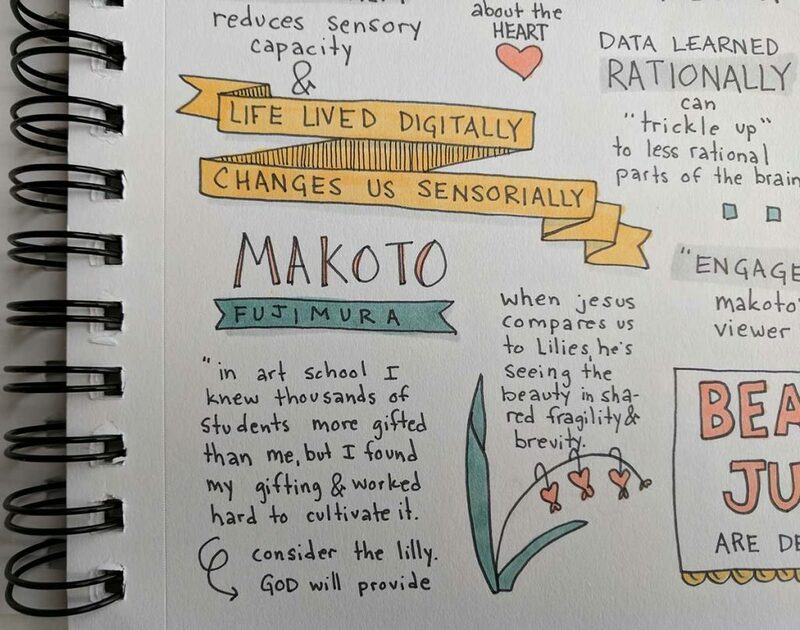 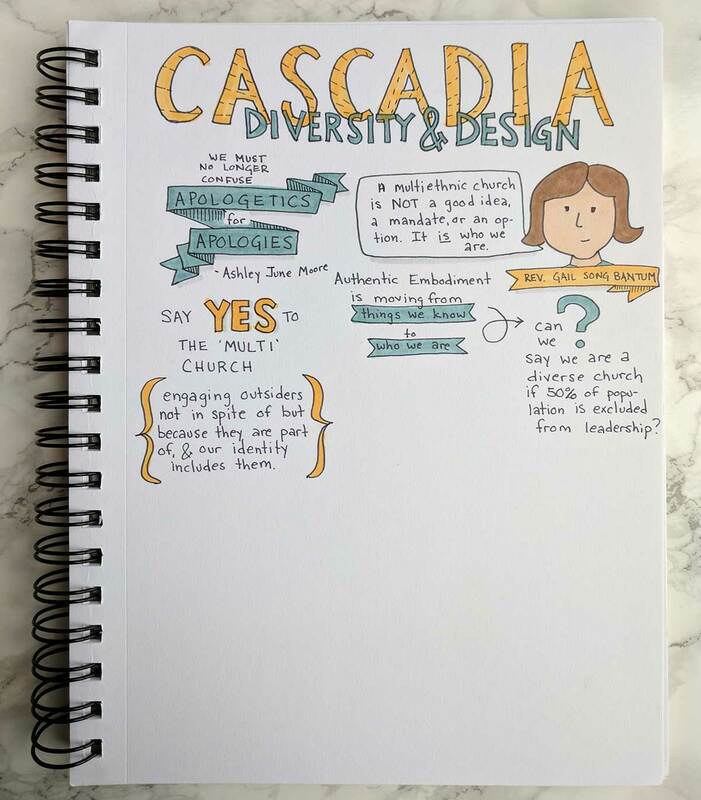 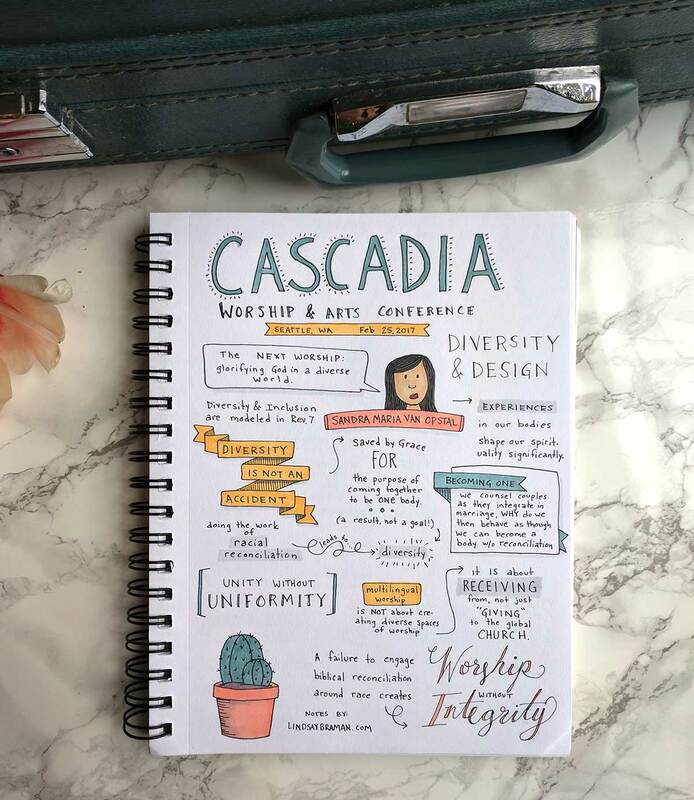 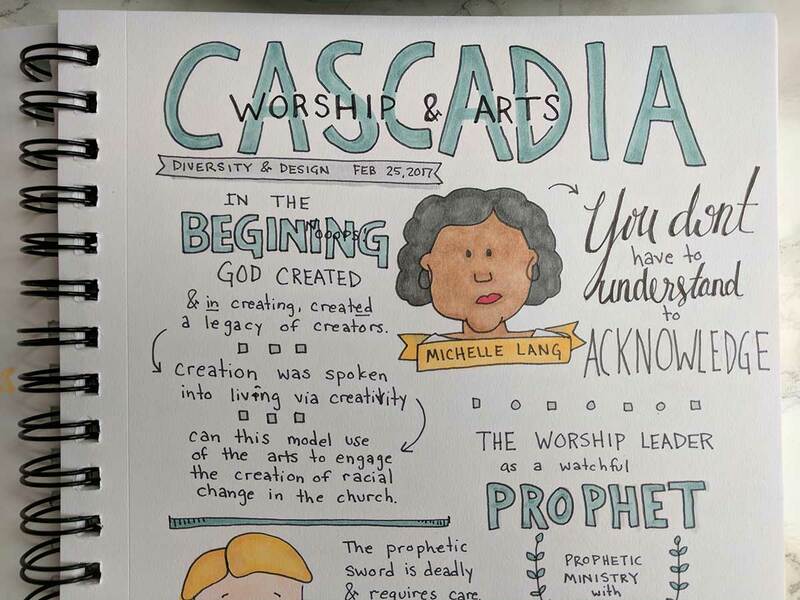 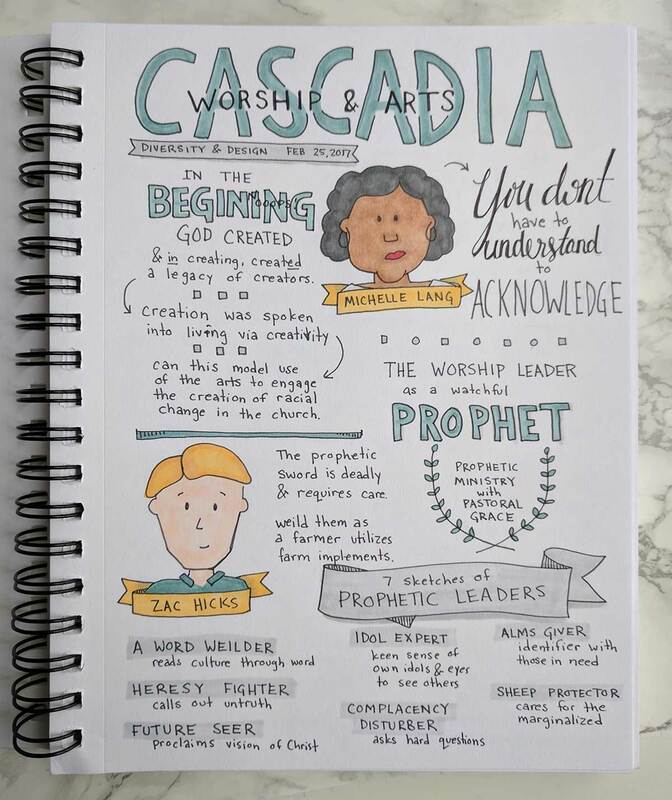 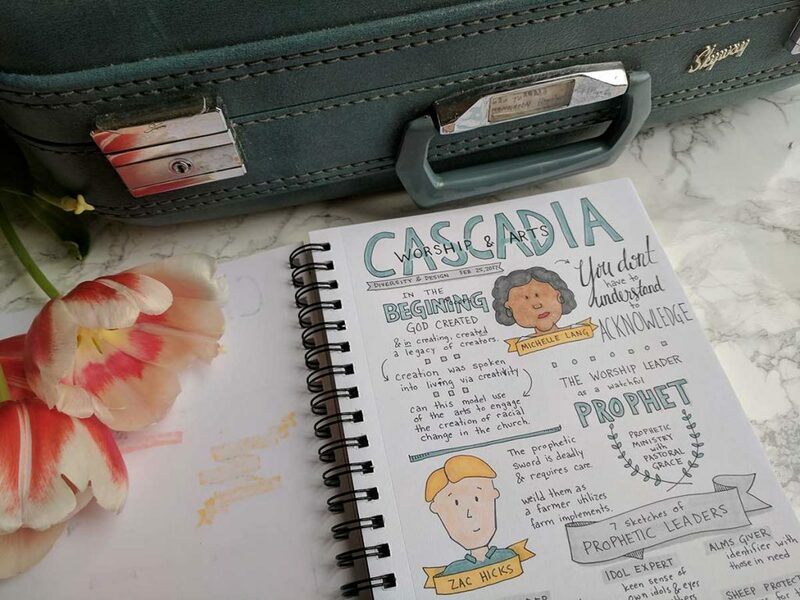 The Cascadia Worship and Arts conference, for 2017, was kind of my first event where I was designated as an “official” graphic recorder. The organizer had welcomed small format work so I approached the conference as I would a class. 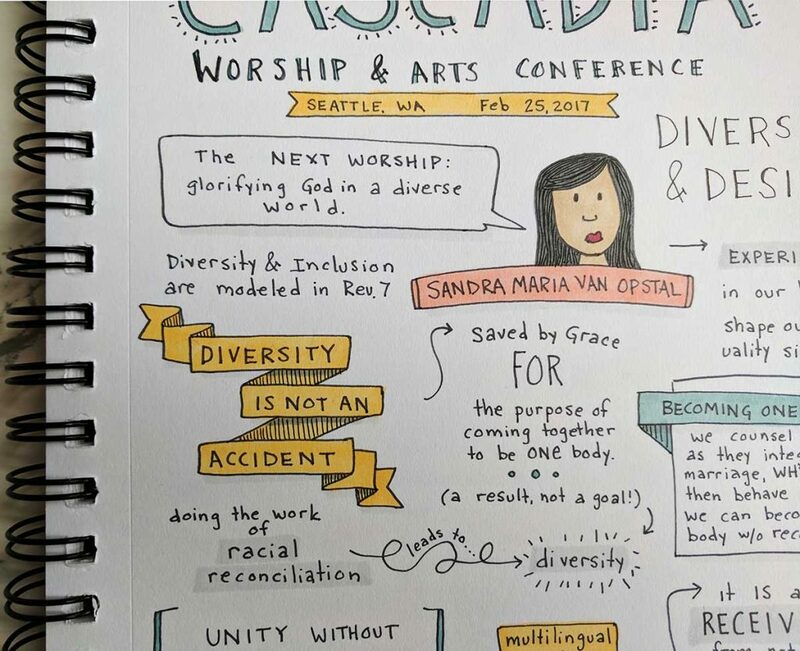 As I write this blog post a few weeks after the close of this conference, and with another event recording expereince, I realize how valuable these early opportunities have been to shaping my method and practice as a professional graphic recorder- as well as really educational about the practical side of graphic recording. 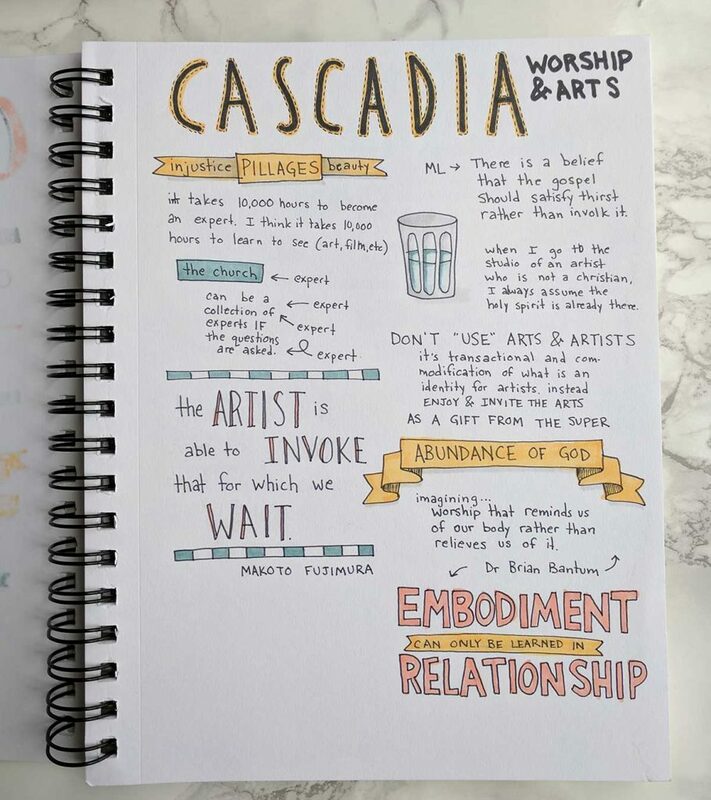 More practical elements of what I’m learning are in regards to how many hours I’m able to do this highly active listening before the quality of my work declines, and helpful data about the tools I need with me. Since it was small format (in a notebook rather than a mounted wall piece), I approached the Cascadia Worship and Arts Conference as I would prepare for taking notes in a course at school- selecting a color scheme and taking with me only the 3 or 4 colors I’d chosen and a few shading markers. 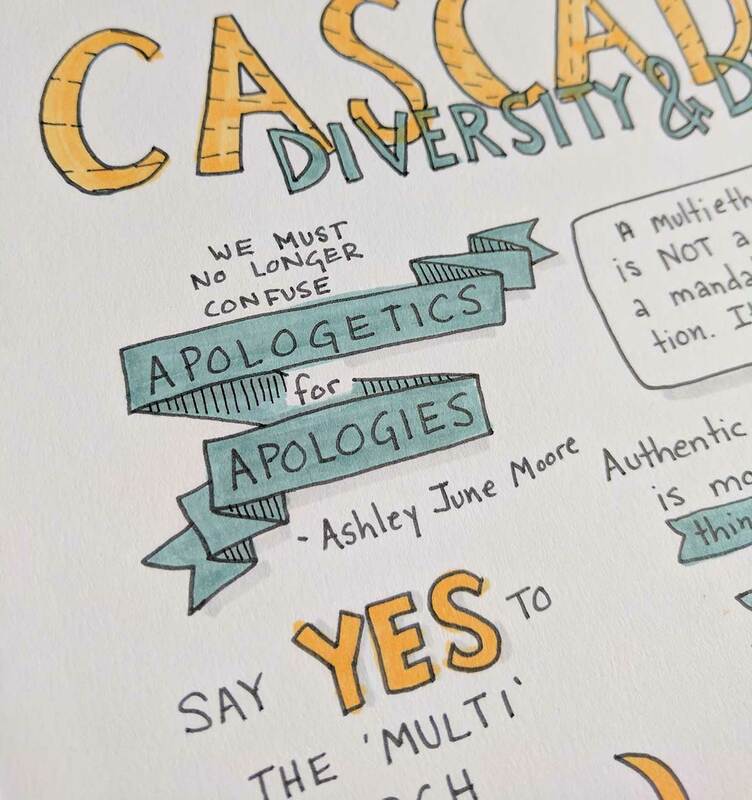 At this event, I learned to always take all my markers with me. Maybe not all the markers shoved in nooks and crannies of my apartment, but at least my train case of markers! Primarily, this came out of the realization that as I grow more comfortable with doodling faces into my notes, respect for the individuality of persons and the skin tone of diverse people means that if there is any possibility of doodling faces, I need to have a full range of skin tones and hair color pigments on hand. 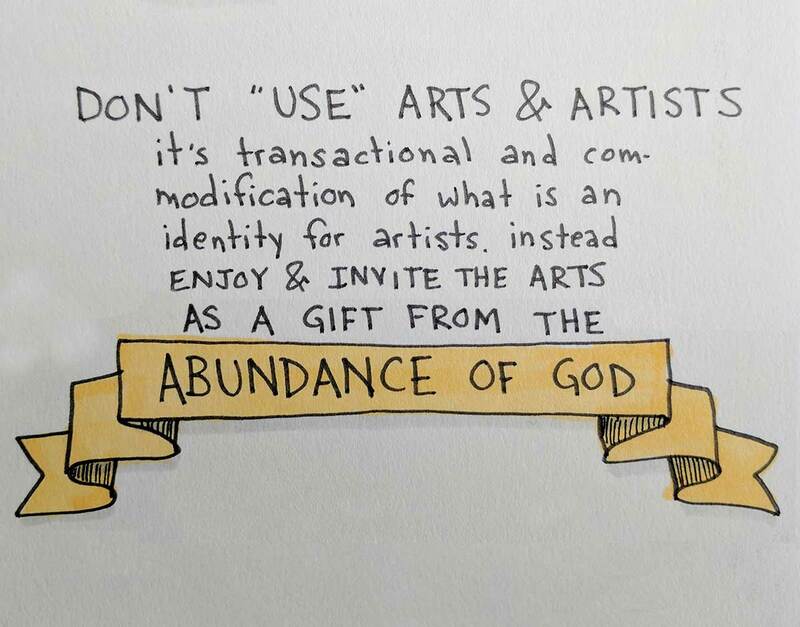 This was not a particularly fun lesson to learn on the fly, although I suppose it might have been necessary. As it was, I found myself leaving uncolored till the following day, after the conference, the faces of people I doodled- which felt disrespectful particularly to people of color who spoke- but I’m thankful this was a lesson learned while still working in a small format notebook rather than on large graphic recording sheets of paper on the wall. 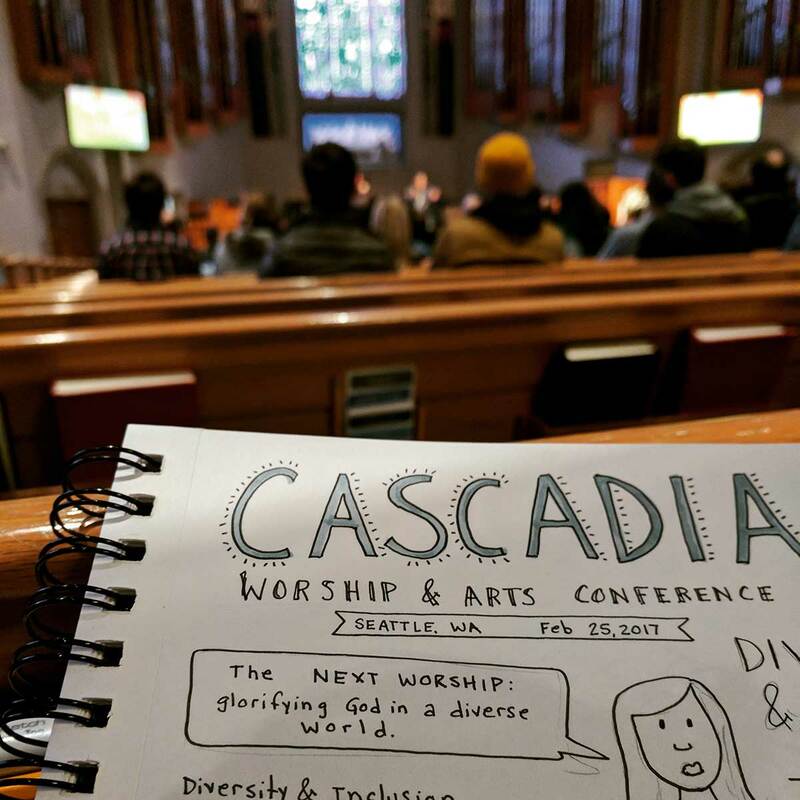 Here are a few shots from the excellent conference celebrating the link between Christian worship and the creative arts, with a particular focus, this year, on how diversity, race, and the global church enter into- or don’t enter into- our churches through worship. 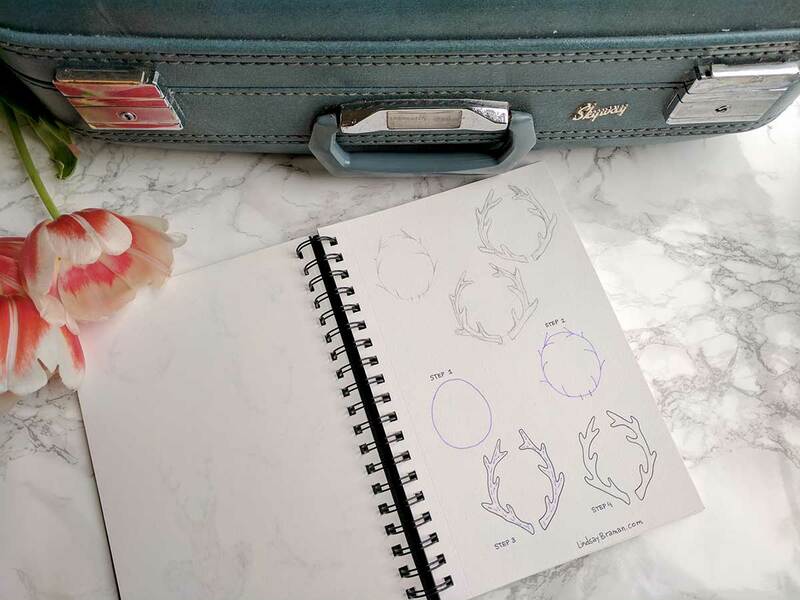 In the photo above you can see how I still sometimes use a quick pencil sketch before adding a complex doodle like a face. 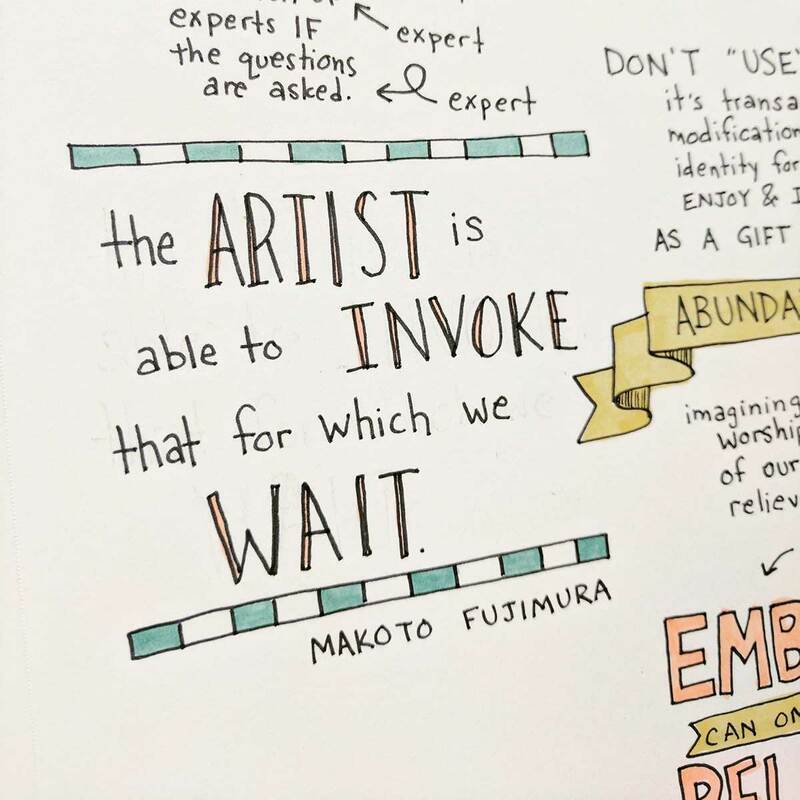 One the outliner marker dries an eraser makes quick work of the remaining line. 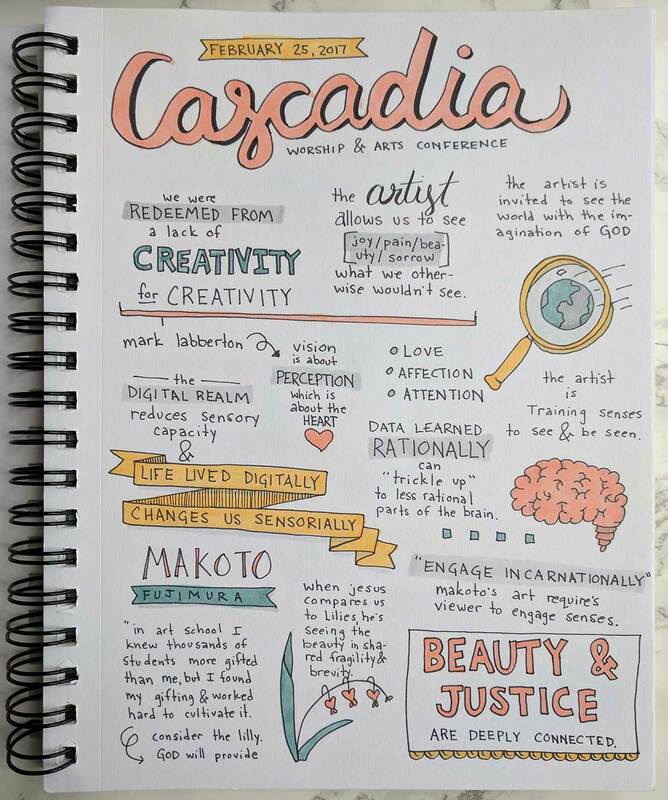 Cascadia was also a learning experience for me in regard to my own capacity. 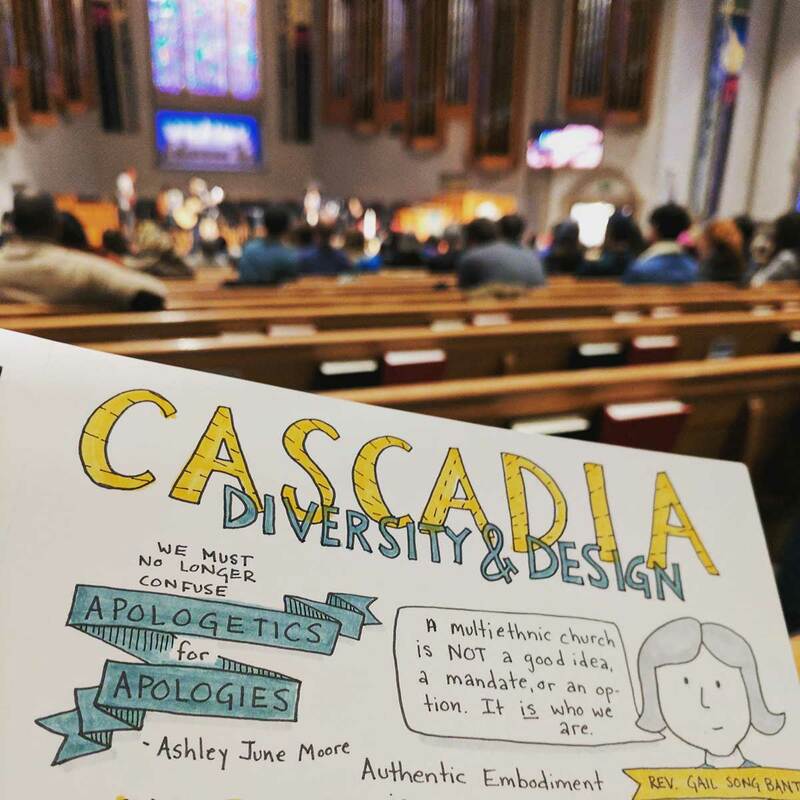 I’d agreed to also post my work on social media through the concert as promotion for the event. 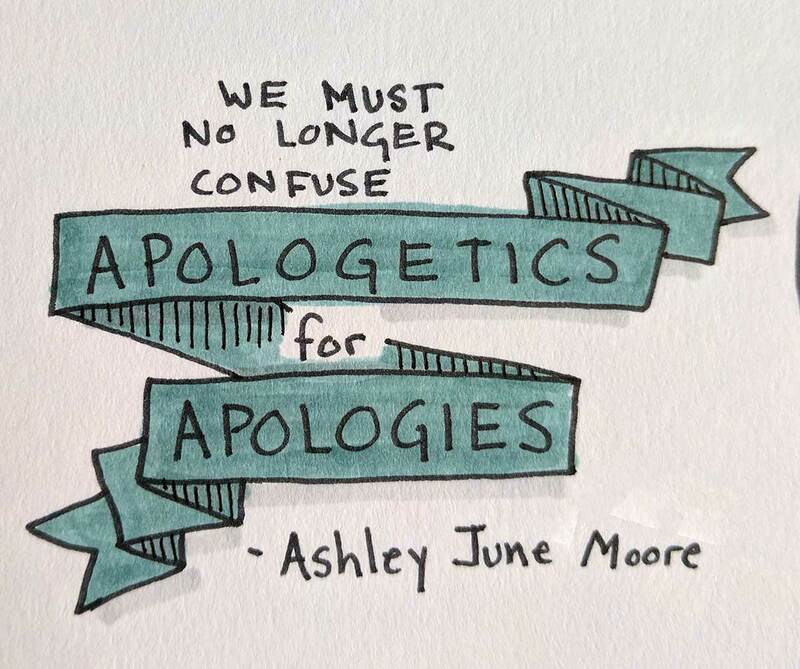 Though agreeable to this arrangement, it proved impossible. 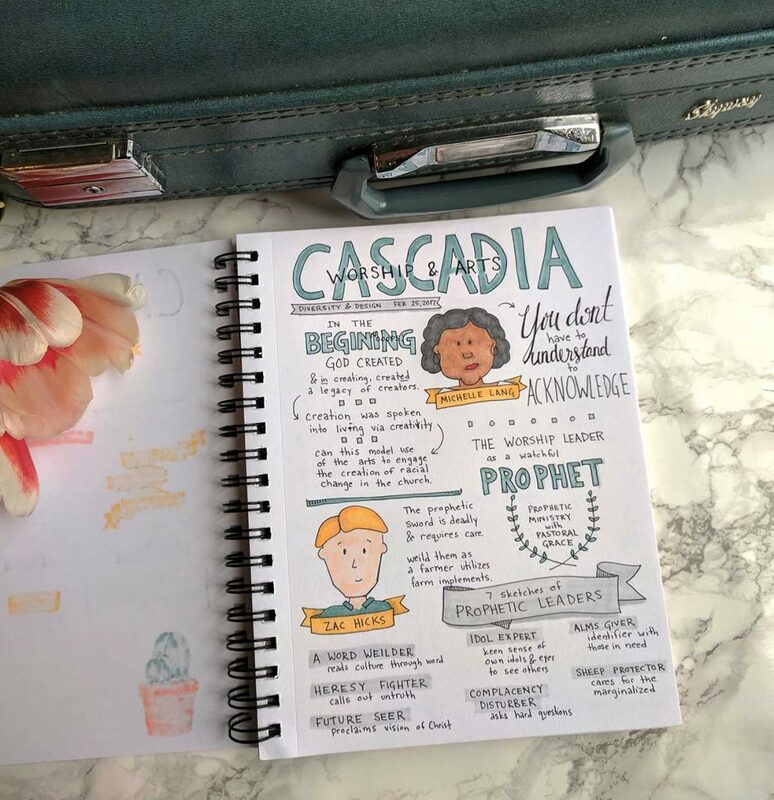 This plan might have worked with a better physical setup (I was unable to spread out my pens and markers at this site) and I chose to try and record the breakout sessions as well instead of using that time to rest, refuel, and finish any uncolored portions of my notes.